The new Beckta at 150 Elgin St. Photo by Anne DesBrisay. Unless you’ve just emerged from a cave you will know the most venerated fine dining restaurant in the capital has moved from a modest house on Nepean Street to a mansion on Elgin. 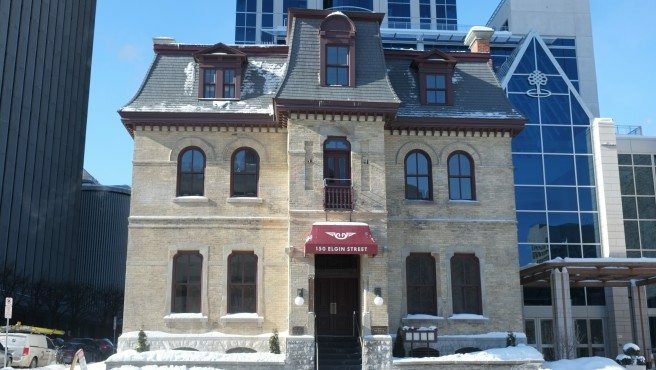 The 140 year-old Grant House is where the 12-year-old Beckta Dining and Wine Bar has been reincarnated, in a space last occupied (for some 37 years) by Friday’s Roast Beef House. The renovation is outstanding, done with elegance and deference. What hasn’t been remade, happily, is the comfort of the Beckta dining rooms, staffed by those who understand the art of running a welcoming restaurant. When Stephen Beckta opened his first restaurant in 2003, it was notable for many things, good food and wine chief among them. But it also injected in our emerging restaurant scene a different way of doing the right thing. It delivered service that was as polished and professional as you’d find at any temple of haute French dining, but friendly and unpretentious. That hasn’t changed. What is a bit different is the menu. If you opt for the tasting menu you are shown twelve words on a page and asked to select five. The words are mostly luxury proteins or sweet things (tuna, scallops, sweetbreads, foie gras, quail, ostrich, mocha … you get the idea). So you know you will be eating fatty duck liver, say, at some point, you just don’t know at what point, or how it’s to be presented. Then you wait to see what arrives. Some might find it fun, and I agree it’s safer than a full-on surprise. But I’m from a school that believes a tasting menu ought to put the chef in charge of balancing the meal, of orchestrating what comes first and what goes next (and why it goes next) and how to end it all. What’s abundantly clear is that the food is as ambitious as ever. There’s no sign of dumbing down to serve more folks at more hours of the day, though during my early visits there were signs that the kitchen was stretched — long waits between courses, lukewarm dishes, some with a deficit of seasoning. There weren’t any duds, but neither were there real triumphs. And this kitchen — the same team from Nepean Street led by executive chef Michael Moffatt and chef de cuisine Katie Brown Ardington — is more than capable of those. And now, after my most recent visit, just last week, I’m pretty confident that the ‘old’ Beckta is back with a kitchen that’s found its groove in its expanded home. The first bite came as we examined the menus — an amuse of tuna tartare with candied lemon and rings of crispy shallots. We licked the spoon clean. 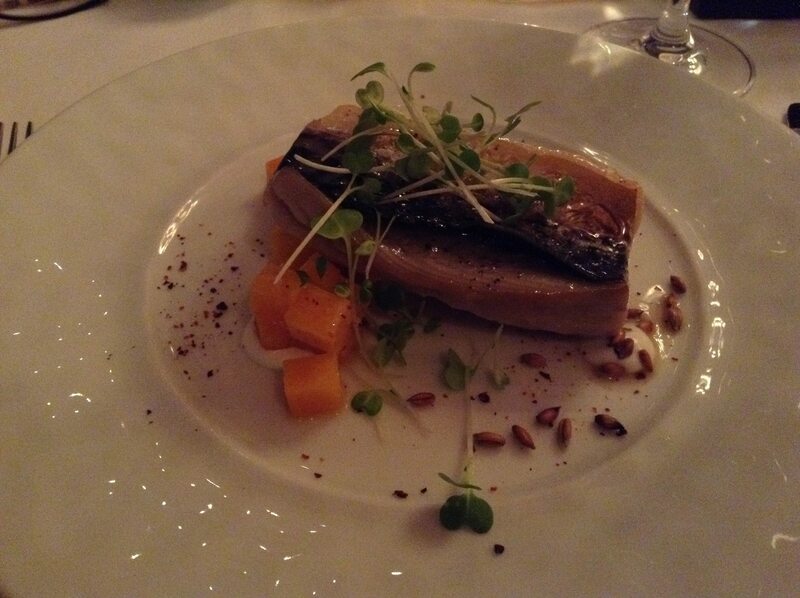 And then, from the prix fixe menu, a mackerel filet, its skin super-crackling crisp and sweet, the flesh beneath juicy and soft, the rich-fishiness countered with crème fraiche and precision cubes of pickled squash. Wide rounds of watermelon radish lent mustard flavour and peppery crispness to a sort of duck a l’orange — thin slices of smoked breast, served as a cold salad with marinated orange, lychee fruit, those stunning radishes, and a drizzle of buckwheat honey. 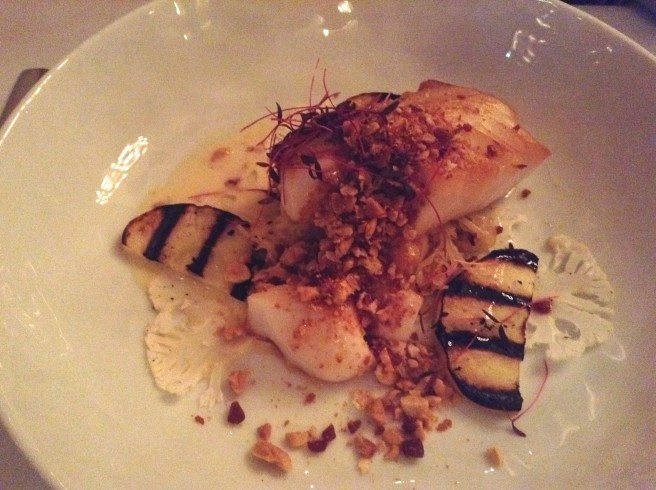 Buttery sablefish was the best of the mains, propped on ribbons of roasted spaghetti squash and doilies of shaved and barely roasted cauliflower. There were charred apple slices for juice and sweetness and a bit of smoke, spiced peanuts in a nubbly granola were sprinkled over top and beneath, an exquisite sauce with the sweet-tang of fresh whey. Star plates from the tasting menu were sweetbreads braised in dashi with pickled cashews; venison served with a chestnut purée; and a rich torchon of foie gras on a parsnip blini, matched with pickled pears, a curried pear butter, and bitter endive, mellowed with roasting. Sea buckthorn curd tart. Photo by Anne DesBrisay. Not everything worked. A salad relied too heavily on a surfeit of raw fennel and under-ripe figs for flavour. And a Berkshire pork chop was a bit overcooked beneath its blood orange marmalade. Desserts were lovely. 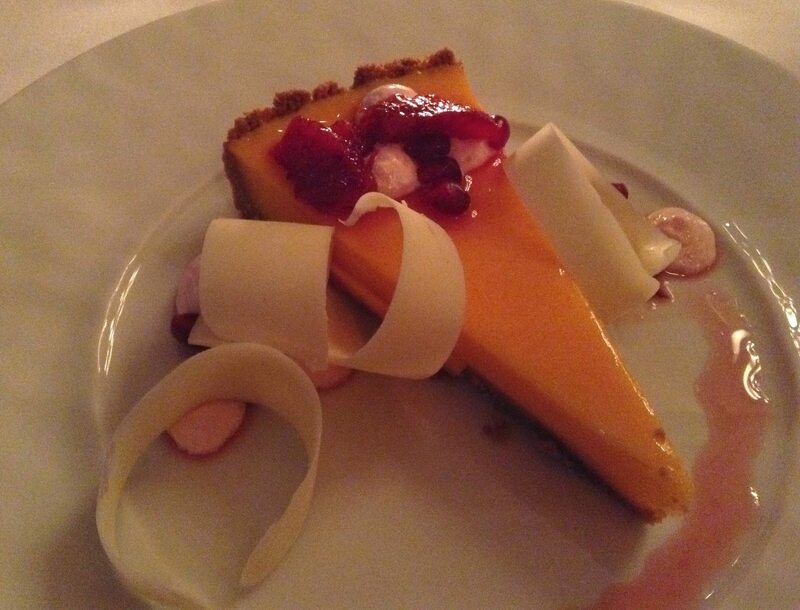 The panna cotta with spongy hunks of olive oil cake was a high point and I adored the sea buckthorn curd tart, cool and light and not over-sweet, topped with candied blood orange and juicy bursts of pomegranate, the tartness tamed with peels of white chocolate. Beckta on Elgin is an oasis of calm, grown-up dining, where carpet, drapes, and thick linen dampen sound, and a welcoming warmth tucks you in. As you did before, you come here for treat dining. The bill will be large (softened somewhat with macarons and chocolate). Stephen Beckta has always had large-scale ambitions for his concept of high-end food and hospitality. He now has the mansion to match.